It’s moving day and it’s time to start using that moving dolly you’ve gotten your hands on. This is going to make moving those heavy items so much easier, right? It’s important that you know how to use a tool that is designed to help you do something more efficiently, and very dangerous to use something incorrectly due to improper training on it. You don’t want to get hurt using a furniture dolly incorrectly and ending up taking on the weight of the furniture onto your body. Take a look at the types of dollies you can use for moving, how they can help you, and how to properly use them. A dolly is a platform on wheels that allows you to move large, heavy items while steering it along the way. This could be used for furniture, appliances, and more. The first type of dolly you made be looking for is an upright utility dolly which is also called a hand truck. This is an L-shaped platform that tends to be small in size needing only two wheels and a handle. By just sliding the lower portion of the dolly under the item, you can then tilt it backward to move the item where you need it to go. This is perfect for just about anything from lightweight furniture pieces to moving several boxes at once. The next type is a furniture dolly that you would use to move large and bulky pieces. When you need to move a couch, dresser, desk, or other big items, you can use furniture dollies for this purpose. It’s intended to work for those heavy items that you wouldn’t use a simpler utility dolly for. You can typically handle up to 1,000 lbs. using a furniture dolly. It just can’t be used on stairs. Another option is an appliance dolly which will work similarly to the utility dolly in the way it’s made but this will allow you to move big and heavy appliances. This is perfect for when you need refrigerators and washing machines. It will secure the appliance in place with strong straps and other safety features. You can roll this one up and down stairs while it carries around 700lbs. First, you’ll want t make sure you’ve cleared the space for a path without any obstacles going towards your destination. Avoid topping a stack on the dolly with anything that will obstruct your view. Use a hand truck for anything going upstairs. Simply roll over bumps straight on if you encounter bumps as you roll onward. To apply an item to your dolly, tip the dolly forward enough that you can slip the bottom flat surface underneath an item. Then you can tip the dolly back on its wheels while holding the item in place with your other hand. 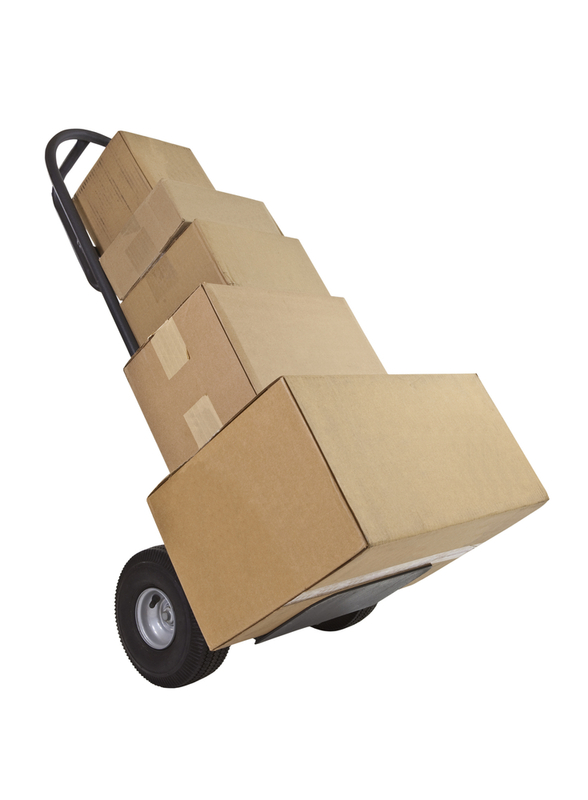 Largest and heaviest items go on the bottom but make sure the whole stack is balanced and aligned. If you are going to be moving appliances, furniture, and other fragile items with the dolly, be sure to wrap these things in furniture blankets while still leaving room to get a proper grip on the item during transport. Take out drawers if moving furniture with loose parts to help make it easier to maneuver and a little lighter in weight. Secure items that you put on these dollies and wrap anything that you want to protect the finish of like a wooden cabinet. It’s important to tie up loose items to avoid damage, such as hoses, plugs, and wires that you don’t want dragging on the floor. If you want to move large items in your upcoming move, call a professional moving company to handle the job for you or practice these safety tips above.